This quick and easy spiced applesauce waffle recipe flavored with cinnamon is the perfect way to start your day. Oats lend a chewy texture and nutty flavor to the batter. 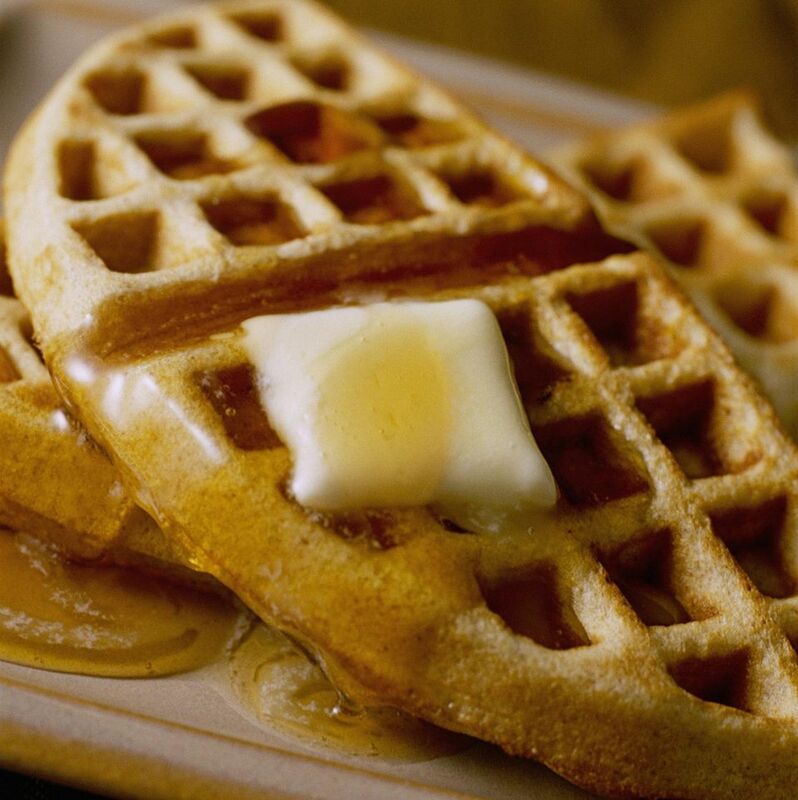 Serve the waffles topped with maple syrup or maple cream (whipped maple syrup is available at specialty food stores). 1. In a large bowl, mix the flour, oats, baking powder, baking soda, and cinnamon. 2. In a medium bowl, whisk the buttermilk, egg yolks, applesauce, melted butter, and brown sugar until well blended. Stir the buttermilk mixture into the dry ingredients until just evenly moistened. Let stand for 5 minutes. 3. Meanwhile, in a small bowl, beat the egg whites with an electric mixer until soft peaks form when the beaters are lifted. With a rubber spatula, gently fold the egg whites into the batter just until combined. 4. Heat a waffle iron. Lightly grease or spray the grids of the iron. Pour 1/2 to 2/3 cup of the batter (or the amount recommended by the manufacturer) into the center of the grids, spreading the batter almost to the corners. Close the lid and bake according to the manufacturer's instructions or until the iron opens easily. 5. Transfer the waffles to the oven, placing them directly on the oven rack so they will remain crisp. Repeat with the remaining batter. 6. Place the waffles on warm serving plates and top with butter and maple syrup. Serve right away. • To make lighter waffles, separate the eggs and incorporate the yolks into the batter. Beat the whites until they are stiff but not dry, and fold them into the batter as a final step. • To keep the first few waffles warm while the rest of the batch cooks, place them in a single layer on a baking sheet inside a 200°F oven. They will stay fresh in the oven for about 30 minutes—plenty of time to finish the batch. • If you’re using melted butter in the batter, it’s useful to have the other liquid ingredients at room temperature. If they’re too cold, the butter will harden into lumps. • Store any leftovers in a plastic bag in the freezer, placing plastic wrap between each pair of pancakes or waffles to keep them from freezing to each other. To serve, thaw and heat in a toaster oven or on a baking sheet in a 350°F oven for 6 minutes, or until hot.